How The Smokey Bear Effect Led To Raging Wildfires Huge wildfires are burning in the West — setting new records for damage this summer. These megafires are burning bigger and hotter than ever before. Scientists say climate change and a century-long policy of fire prevention — which inadvertently turned forests into giant tinderboxes — are to blame. 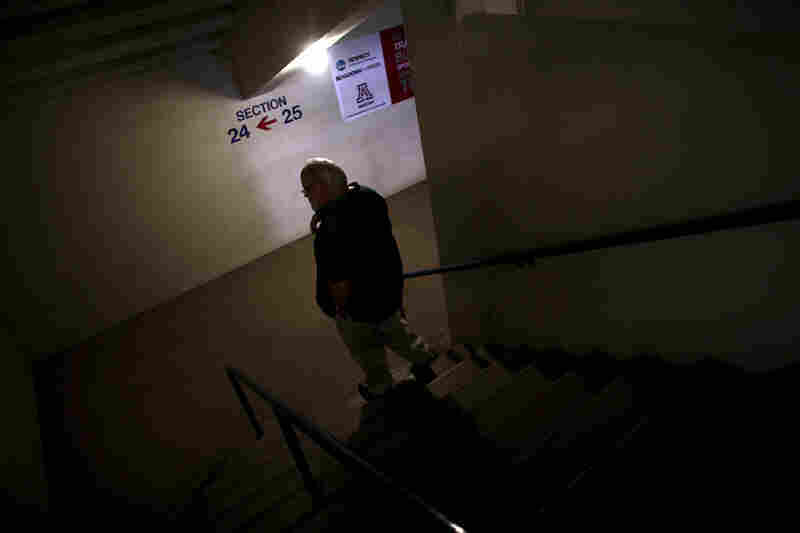 The history of fire in the American Southwest is buried in a catacomb of rooms under the bleachers of the football stadium at the University of Arizona. Here rules professor Thomas Swetnam, tree ring expert. You want to read a tree ring? You go to Tom. He's a big, burly guy with a beard and a true love for trees. Tree sections are stacked floor to ceiling. They're like rounds chopped from a carrot, the carrot being a tree trunk. They're the size of dinner plates. When the football team scores, they rattle on their shelves. 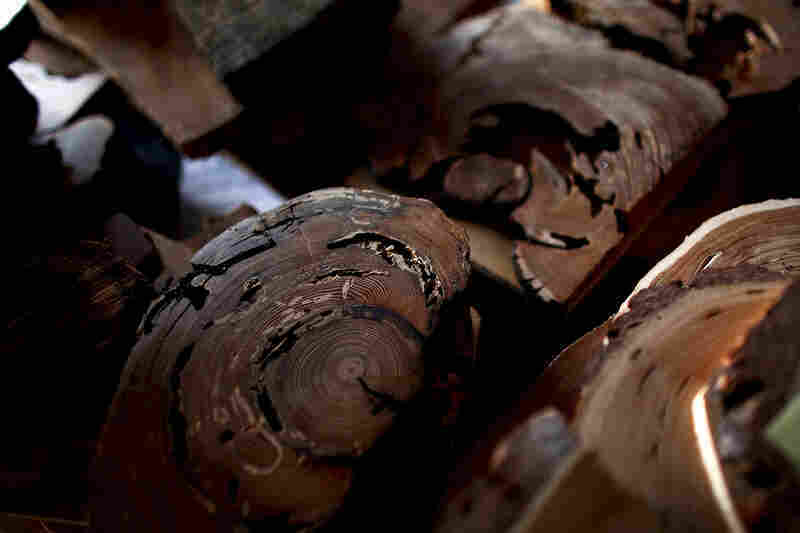 Growth rings tell how old the sectioned tree was. But when Swetnam holds up one, he points to something else: fire scars. They're black marks, about the size of a fingernail clipping, left by fires. "The first time here, back in the 1600s, it looks like, and it created a wound there. Basically the fire was hot enough to burn through the bark," he says. But the fire wasn't hot enough to kill the tree. So the next few rings show normal growth. "Until the next fire occurs, and it creates another scar," he says. "And another, and another, and another, and another, and another." 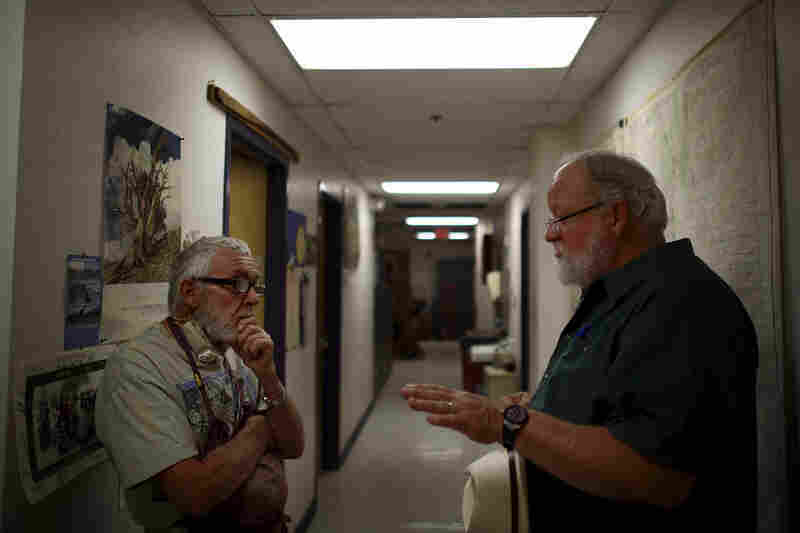 University of Arizona professor Tom Swetnam examines a tree sample at the Laboratory of Tree-Ring Research in Tucson, Ariz. Swetnam's research focuses on understanding how forest fires are influenced by climate change. Swetnam holds a tree ring sample; it shows no forest fire scars from the past 100 years. The Forest Service's aggressive efforts to fight fires over the past century have had unintended consequences. 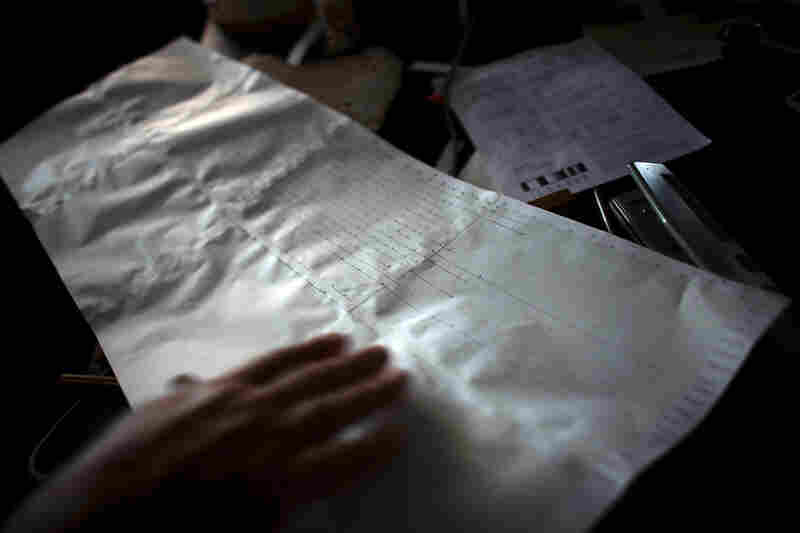 A tree's rings are marked on graph paper. 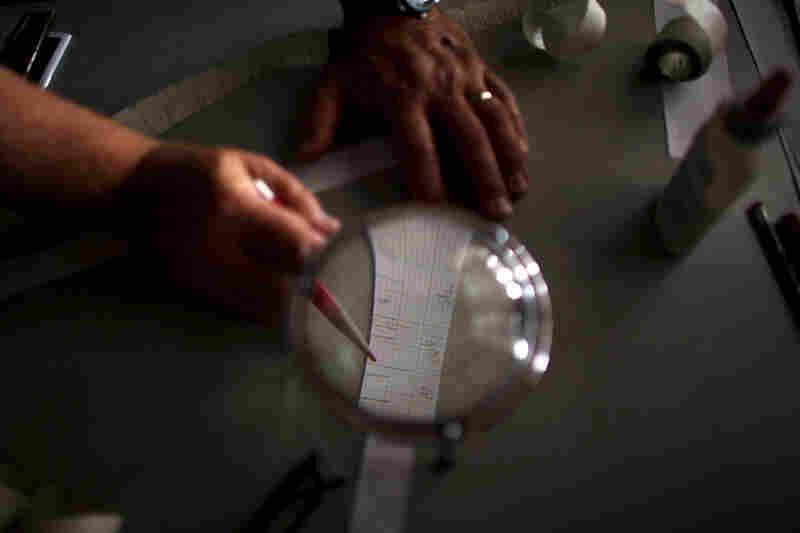 Experts use this technique, called skeleton plotting, to help them cross-date tree-ring samples. This sample evinces no fire scars in the latest years of the tree's life. 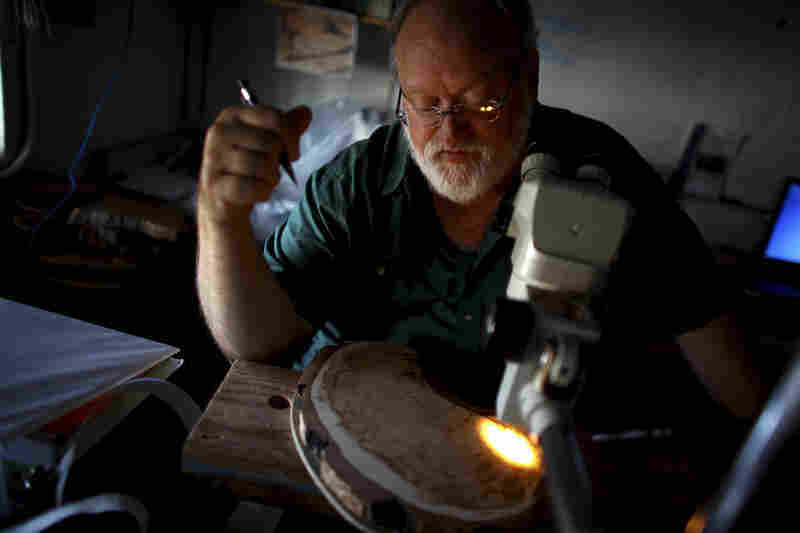 Rex Adams, a senior research specialist at the Laboratory of Tree-Ring Research, steps away from a band saw that he uses to slice tree ring samples. 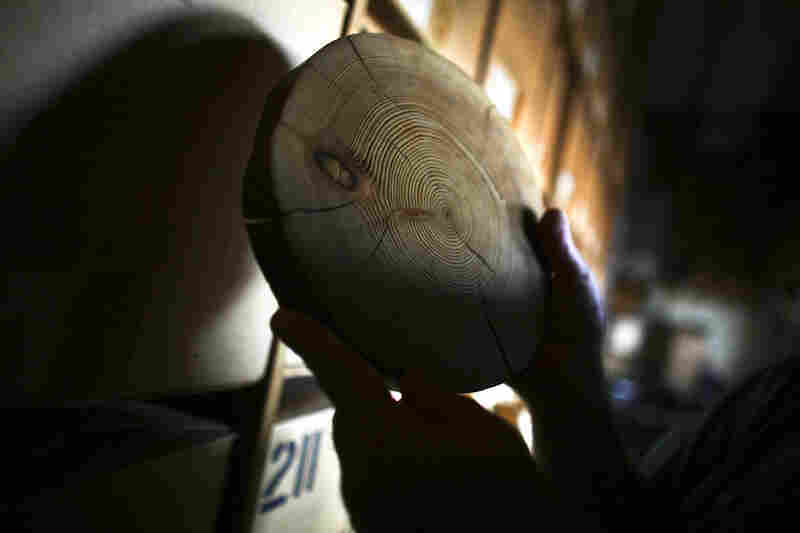 Tree-ring samples are collected from every corner of the world and meticulously studied and stored in Swetnam's lab. The thick, dark rings on these samples are fire scars. 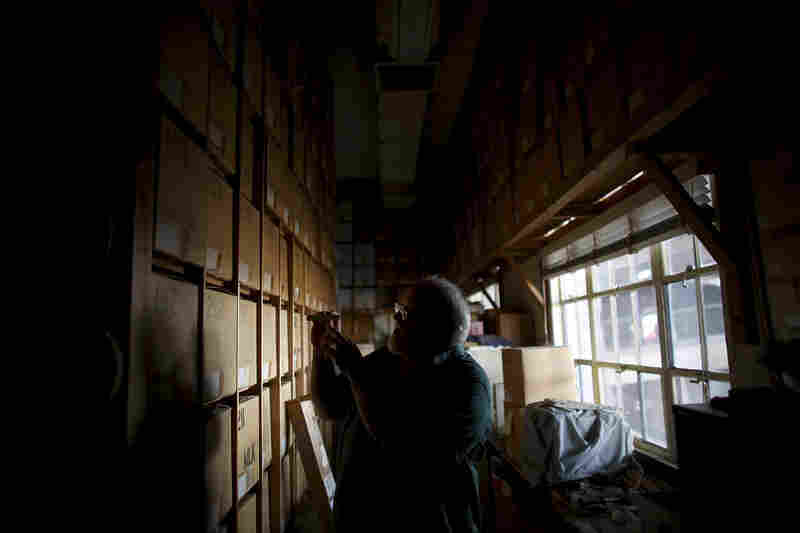 Last year, more than 74,000 wildfires burned over 8.7 million acres in the U.S.
Swetnam stands in the catacombs of storage boxes that house thousands of tree-ring samples. 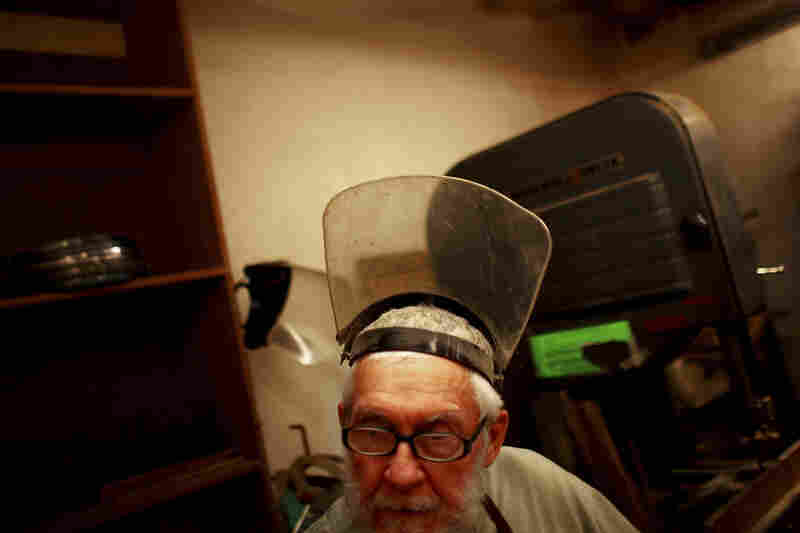 His laboratory is buried under the bleachers of the University of Arizona football stadium. 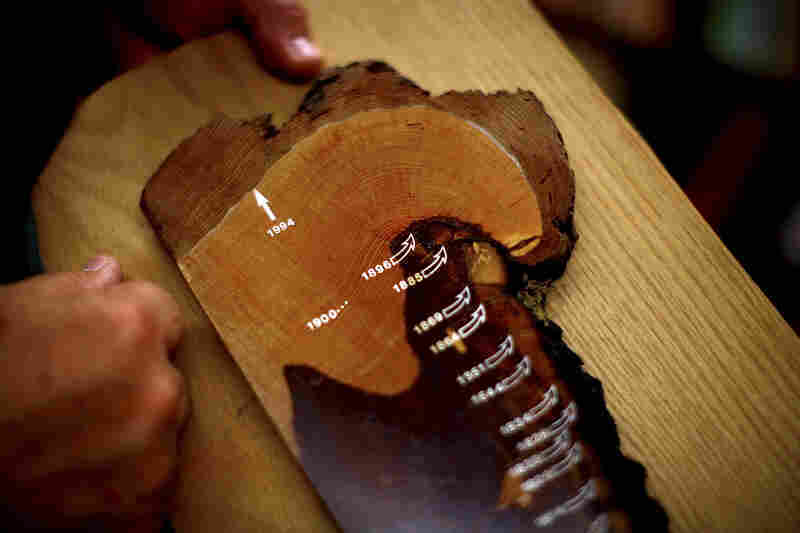 A perfect tree-ring slice is a window in time, a slice of a forest's history. By cross-dating different tree-ring samples from a given area, researchers can get a clearer picture of how a forest burns. Adams (left) talks with Swetnam in their laboratory, nestled under the football stadium. Swetnam leaves his laboratory for the evening. Fires in the Southwest have been getting bigger and bigger over the past two decades. The Wallow fire in Arizona, Swetnam says, was "a tornado of fire." "It burned more than 40,000 acres in the first eight hours," he says. "Around 1890 or 1900, it stops," Swetnam says. 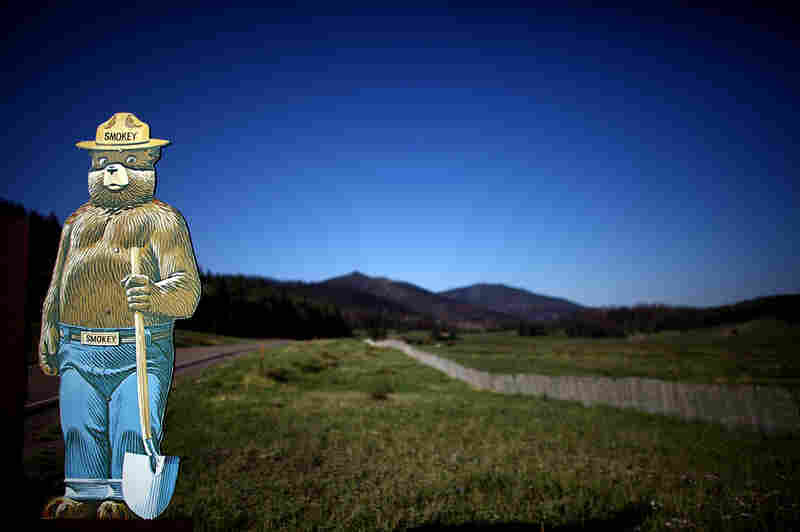 "We call it the Smokey Bear effect." Settlers brought livestock that ate the grass, so fires had little fuel. Then when the U.S. Forest Service was formed, its marching orders were "no fires." That's the view of fire historian Stephen Pyne. "The irony here is that the argument for setting these areas aside as national forests and parks was, to a large extent, to protect them from fire," Pyne says. "Instead, over time they became the major habitat for free-burning fire." So instead of a few dozen trees per acre, the Southwestern mountains of New Mexico, Arizona, Colorado and Utah are now choked with trees of all sizes, and grass and shrubs. Essentially, it's fuel. And now fires are burning bigger and hotter. They're not just damaging forests — they're wiping them out. Last year, more than 74,000 wildfires burned over 8.7 million acres in the U.S.
"It burned more than 40,000 acres in the first eight hours," says Swetnam, the tree ring expert. "A tornado of fire." "Now the fire behaviors are just off the charts," Swetnam says. "I mean, they are extraordinary. Actually, I think in some cases, they're fire behavior that probably these forests haven't seen in millennia or maybe even tens of thousands of years." The choice is not whether or not these forests burn. The choice is how they burn. Over the past several years, even as fewer fires have struck the Southwest, they've burned more land. The U.S. Forest Service now spends about half its budget on firefighting. Many fire experts embrace controlled, or "prescribed," fires — purposely set fires that do the cleanup job that small natural fires once did. It takes the tinder out of the tinder box. But people have built homes and towns close to forests; they don't like the smoke, and prescribed burns sometimes get out of control. The Cerro Grande Fire in New Mexico in 2000 was a controlled fire — until it jumped fire lines and destroyed hundreds of homes. I talked to veteran fire manager William Armstrong of the U.S. Forest Service about that, sitting on a ridge near Santa Fe, where he has done prescribed burns himself. Armstrong says people must accept fire in their lives. "Large blocks of forest — if they want those — then what they must understand is that fire is inevitable," he says. A Smokey the Bear fire prevention sign sits in Valles Caldera along Highway 4, which was one of the front lines in fighting the Las Conchas Fire in 2011. He says to save forests from total annihilation — and the wildlife and water supplies they protect — you have to set some fires and let some natural fires burn. "The choice is not whether or not these forests burn," Armstrong says. "The choice is how they burn. What kind of intensity are we going to see those burn at?" But as fire experts like Craig Allen, an ecologist with the U.S. Geological Survey in New Mexico, are now discovering, fire is increasingly out of their control. "Basically, the mountains in the Southwest — you can almost think of them as caskets of fuel," Allen says. "Gunpowder has been building up in these things for a century, and now it's dangerous to try to defuse."